If you’re tired of the classic barbecued burger, have we got a recipe for you. It combines the things you love about a burger and adds a touch of sophistication. You might even say it’s the grown up version of the old standby. There are two things that make this burger unique – the all-pork patty and the delicious grilled Ambrosia apple ring on top. There is no denying the classic pork/apple flavour pairing. We took it out of the pan and put it on the grill. What you end up with is a beautifully caramelized Ambrosia apple ring (or two) on top of a perfectly seasoned pork burger. You also end up with a lot of satisfied palates. Here’s the recipe (serves 4). In a bowl, combine lean ground pork, diced onion and spices. Mix gently with hands and form into four patties. Core and slice the Ambrosia apple into rings about 1/8″ thick. We like to do them thin so we can have two per burger but you can go as thick as 1/4″ if you want. Place burgers on a grill at medium-high heat for 5 – 6 minutes and flip. Total cooking time for burgers, depending on thickness, should be about 10 minutes but use a meat thermometer to make sure the burger is cooked all the way through. While the burgers are cooking, place Ambrosia apple rings on the grill for 2-3 minutes on each side. Place the burger on the bun. Add condiments (to taste) and place 1-2 slices of grilled Ambrosia apple rings on the pork burger. Serve and enjoy! If you like your burgers cheesy, sharp cheddar goes perfectly with the caramelized Ambrosia apple! To really take this dish over the top, serve burgers with some Kohlrabi Ambrosia Apple Slaw. We’d love to see your results! 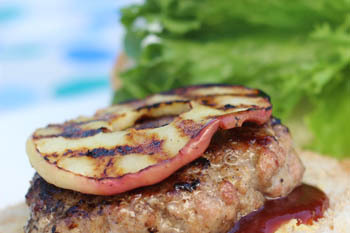 Share pictures of your Grilled Ambrosia Apple Pork Burgers with us on Twitter, Facebook, Pinterest, or Instagram. And, let us know how everyone liked them.